After years of debate, Waukesha and Milwaukee strike a historic, 40-year deal. Ald. Jim Bohl, Ghassan Korban, Jennifer Gonda, Mayor Tom Barrett, Mayor Shawn Reilly, Ald. Aaron Perry and Dan Duchniak. Photo by Jeramey Jannene. The taps in the city of Waukesha will run with Milwaukee water from Lake Michigan. The announcement was made at the Pilot House at Discovery World, located along Lake Michigan, whose water Waukesha has sought for years as a solution to its water woes. 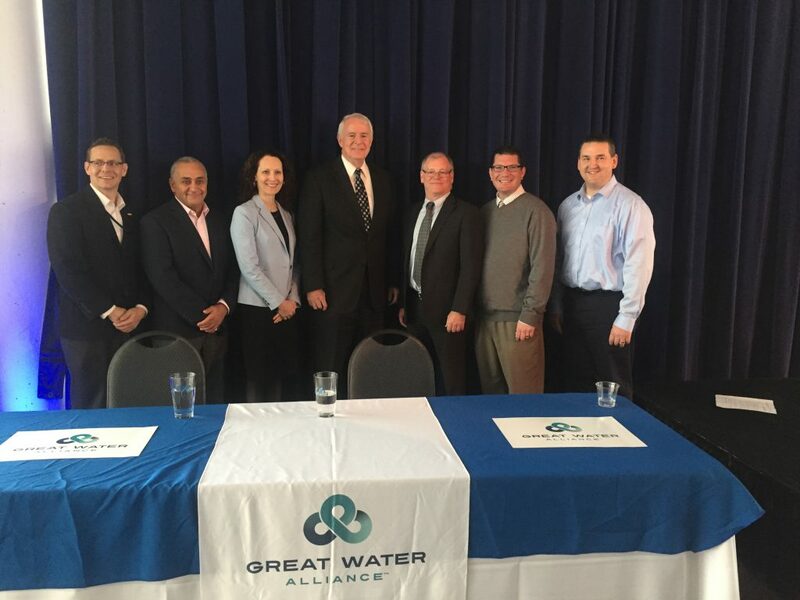 Milwaukee Mayor Tom Barrett billed the partnership as “the most significant intergovernmental cooperation agreement in southeastern Wisconsin history.” The deal is expected to save Waukesha water customers $40 million over other alternatives just in up-front capital costs, and an estimated $200 per customer annually. The move will net a major new customer for the city-owned Milwaukee Water Works and funding which Milwaukee intends to use to replace lead laterals. After years of negotiations and multiple Waukesha mayors, Barrett and Waukesha Mayor Shawn Reilly praised each other from the podium at Monday’s press conference before taking ceremonial swigs of water. Reilly stated “it is my hope that our partnership will lead to additional opportunities for us and others to work together.” Barrett praised Reilly, who was first elected in 2014, for never allowing politics to enter the discussion. Reilly estimates the water will start flowing to Waukesha in 2023, after permitting and construction are complete. At that point Waukesha will beginning paying Milwaukee at least $3.2 million annually for 6.1 million gallons of water a day. The payments will rise to $4.5 million if Waukesha uses the full 8.2 million gallons they’re authorized. In addition, Waukesha will pay Milwaukee $2.5 million in 2020 that the city intends to use to replace lead laterals. Waukesha will then make 20 more payments of between $150,000 to $200,000 annually to Milwaukee, outside of the purchase of the water. The city has received similar payments when it did deals with New Berlin and Greenfield. Waukesha, which sits outside of the Great Lakes basin, currently has a well water system that is under state order to be replaced or overhauled following the 1987 discovery of substantial amounts of radium in their drinking water. While the city fought the mandate for decades in court, the Waukesha Water Utility spent more than $1 million for consultants to study the various water alternatives, and concluded the only solution was to purchase lake water from Milwaukee, Oak Creek or Racine. The city finally secured an exemption from the Great Lakes Compact in June 2016. The federal law requires unanimous consent of the governors of the states bordering the Great Lakes for any diversion outside of the basin. Waukesha was the first city to apply for a diversion under the 2008 federal law. The city spent years preparing a bid, and cycled through mayors Larry Nelson and Jeff Scrima in the interim. Waukesha received the unanimous approval, but only after amendments offered by Minnesota and Michigan reduced the geographic size of their request and the number of daily gallons withdrawn. Waukesha, with the blessing of the state Department of Natural Resources, had sought to include an expansion of their service area with their request. The expansion of service was an issue that the city of Milwaukee had long opposed. Part of securing the approval was having a partner in Oak Creek who was willing to sell Waukesha the water. Milwaukee had balked at promising to sell the water unless the service area was reduced. Waukesha signed an exclusive letter of intent with Oak Creek to supply water. When that agreement expired in May 2017, according to Milwaukee Water Works superintendent Jennifer Gonda, the city jumped in and began negotiating with Waukesha again. They made Waukesha an offer they couldn’t refuse. The Milwaukee offer will save Waukesha $40 million over the Oak Creek proposal, a large portion of which is because the pipe infrastructure to reach Waukesha is significantly shorter from Milwaukee. In addition, Mayor Reilly notes that the Milwaukee offer included a cheaper wholesale rate for water. Reilly praised Oak Creek in an interview, but Oak Creek, whose customers were set to see large reductions in their water bills under their offer, likely feels like they were left at the altar. Barett also praised the south side suburb, stating “we don’t have any negative words about Oak Creek.” The mayor stated “As I always said, if someone was going to sell water to Waukesha, I wanted it to be Milwaukee.” He noted that “when Shawn came in he picked up where [former mayor] Larry Nelson left off” and the two sides were able to get a deal done. Barrett left out Nelson’s successor Jeff Scrima, whose adamant opposition to buying water from Milwaukee eventually left him at odds with Waukesha’s political and business leaders. Department of Public Works Commissioner Ghassan Korban notes that building the pipe infrastructure will be a joint effort between Waukesha and Milwaukee. Per the agreement between the two communities, Milwaukee is responsible for leading the construction of a main from S. 68th St. to S. 84th St. and W. Cold Spring Rd. ; from there Waukesha will take the water and connect it with their water system. According to Reilly construction on the infrastructure is expected to start in 2020. The deal is valued at $286.2 million. The agreement must next be approved by the Common Councils of both Waukesha and Milwaukee. Waukesha Common Council President Aaron Perry was in attendance today and praised the deal, while Milwaukee council president Ashanti Hamilton was unable to attend because of a conflict with a city committee. The Milwaukee Water Works, a city-owned entity, supplies water to Milwaukee and 14 other communities. Those include Brown Deer, Butler, Franklin, Greendale, Greenfield, Menomonee Falls, Mequon, New Berlin, Shorewood, St. Francis, Thiensville, Wauwatosa, West Allis and West Milwaukee. The utility has excess capacity following years of large industrial customers reducing their water usage. Waukesha will return the water to Lake Michigan via the Root River as part of the deal. The city will continue to treat their wastewater independent of the Milwaukee Metropolitan Sewerage District. Random thought: Jim Bohl is an anti-fluoride weirdo who keeps trying to get the city to stop using it (and successfully lobbied to have it reduced, yet here he is at this bill signing with a smile. Is he smiling because he’s pumping Waukeshan’s full of Fluoride? Weirdo? Perhaps people should have the right to choose what they ingest? Really. Who was stopping him?